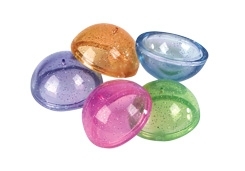 Flip these flexible Hoppers inside-out and place them on a hard surface. Stand back and watch them POP into the air! Colors vary. Translucent glitter pattern.